Thanks so much for the quilt-back explanations, guys! I never would have thought of how the quilting seams need to line up. But I do have a follow-up question - it feels like a lot of quilts these days are quilted freehand, with those loopy random swirls and whirls. That kind of pattern doesn't really need a plain back, does it? Anyway, in my case, I probably should have mentioned that I'm not planning to quilt this thing - the inside is going to be an old down comforter and I'm guessing those feathers would make for way more broken needles than I want to deal with (how many do I want to deal with, you ask? Um, zero.). So instead I'm taking the lazy coward's way out - I'm going to tie this baby. Oh, and no, I totally didn't prewash - again, for laziness reasons. Last time I prewashed, the fabric went totally out of square and added an extra layer of annoying to the cutting out. I like to take the easy way out and use the fabric hems as guides. Also, since a lot of these flannels are polka dotted, I was basically cutting along the dotted lines much of the time, rather than laboriously measuring everything out. In my defense, I am still somewhat traumatized by the amount of time this thing took. 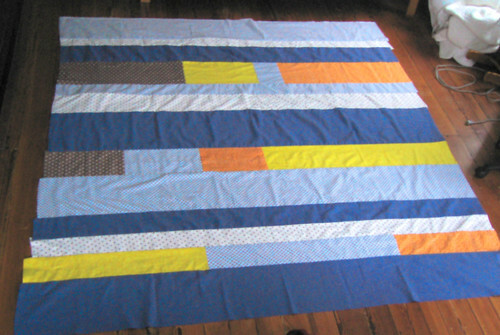 I love tied quilts, so you shouldn't say that it's the lazy way out. It's just the choice you made for asthetic reasons. Your quilt will look great no matter what you do. i like the color choices - the quilt can basically be double-sided because both sides are very pretty. Sorry it took so long to comment! I don't think a plain back is crucial for a swirly quilting, but it might accentuate the work more depending on what pattern you chose for the back. Thread color and stitch style could also highlight the quilting if you ever chose that route. Tying isn't lazy! It's so cozily vintage, and nothing handmade (esp as a mother of 2 babies!) has anything 'lazy' about it!! I agree that pre-washing distorts shape somewhat--but I've converted by learning the hard way that I'd prefer to know what distortion I have to work with, versus finding out after I've put the work in and am stuck with a perhaps more mediocre final product.